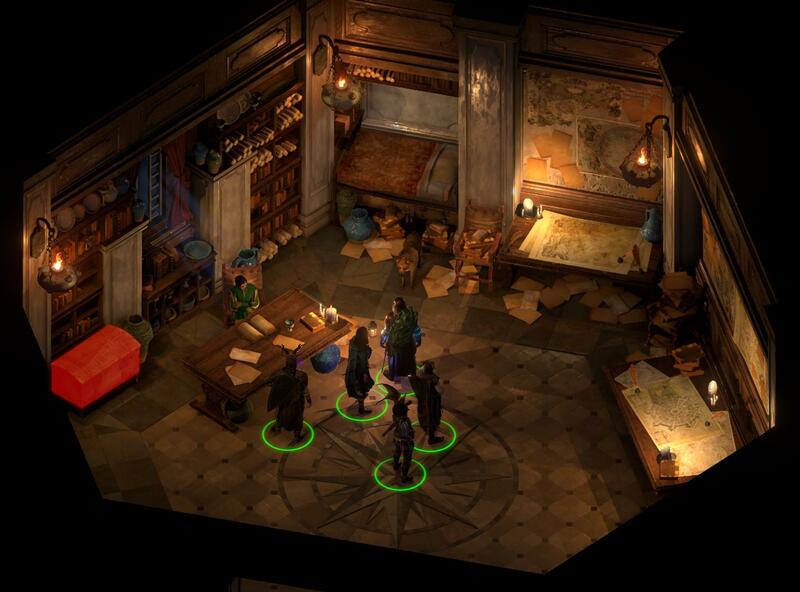 Pillars of Eternity 2: Deadfire is to Pillars of Eternity what Baldur’s Gate 2 was to Baldur’s Gate. There are some gameplay improvements but mostly the game is very similar, just way bigger. My total playtime was about 80 hours, and that’s without any expansions. The name stems from the caribbean-themed archipelago of Deadfire, to the south of the continent that was the first game’s setting. The sequel is not only set in the same world but continues the same story with a number of returning characters, so if you haven’t played the original game yet I suggest you stop reading this review and do so first. Deadfire can import a final PoE save file to reflect your choices in that game, or you can go through a questionnaire to the same effect. Where the Watcher previously had a keep that was mostly useless except as a random quest generator, he now has an upgradeable ship used to move around the Deadfire archipelago. Upgrades matter, both for travel speed and combat performance at the many naval encounters. Those have a nice text adventure interface for maneuvering and firing cannons, which is indeed relevant while fighting superior vessels. Once two ships close you can talk and/or fight on a tactical map sampled below. Who might control those other vessels? Of course Deadfire once again has a faction system. There are the Principi pirates, the Royal Deadfire Company, the Vailian Trading Company, and the native huana among others. Many quests require you to hunt down some ship from an opposing faction. You can form alliances or make enemies, but this is largely a self-contained sub-game that affects little but the final narration before the end credits roll. Seaborne movement adds a neat extra layer to the geography. There are of course still the overland travel maps and the actual location maps, but now there are also sea maps for ship travel and naval encounters. The maps are a lot more expansive than in the original game, yet if anything interactive content is more frequent. 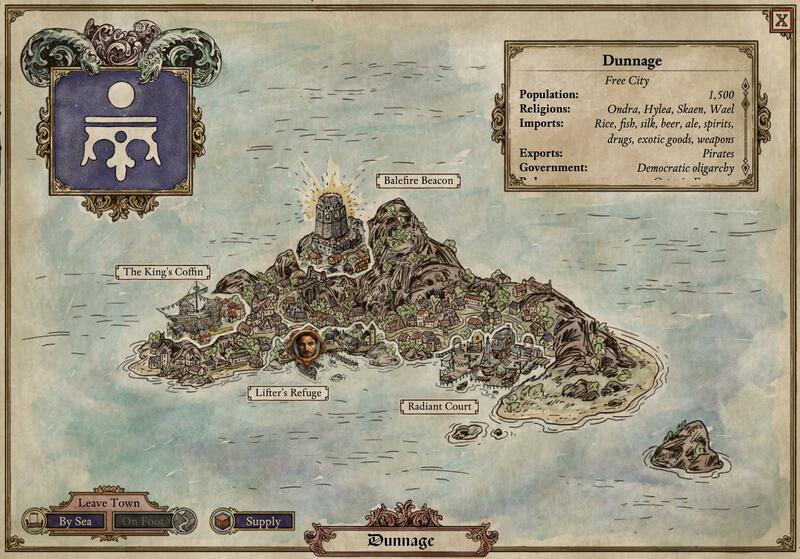 Islands are presented in a nice parchment style, here for the pirate hotspot of Dunnage. Your reason for being in Deadfire is that Eothas, now revealed as the actual Engwithan construct-god, is on a rampage there. The Watcher is tasked by another god to oppose him. Unfortunately, and perhaps predictably, the gameplay fails to live up to this divine drama. You can have much banter with the gods but only at their discretion, and no further interactions as far as I can recall. In the end you independently choose a dialog action for a narrated cut scene – that’s it. My general impression is that Deadfire greatly improves on the usability of PoE. I did not have nearly as much trouble to figure out what I was supposed to do, or how to go on about it. The quest almanach in particular is much better. There is however the usual Obsidian bug toll for a newly released game which is still busily being patched. I got quite a few crashes, and one point where ship collisions stopped working. The bugs did not prevent me from finishing the game, though. 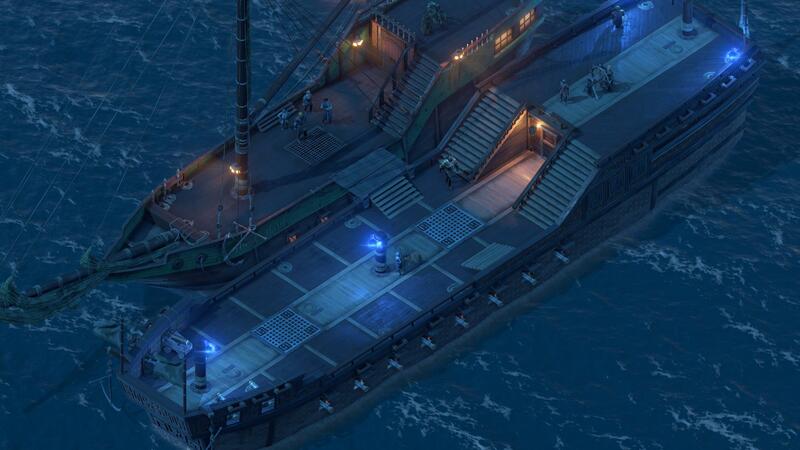 Presentation is again excellent with its upgraded version of the old isometric Baldur’s Gate style. Character classes now include subclasses and allow dual-classing. This extends to companions which now can select from two classes each, at your discretion. On top of seven companions you have a choice of four “sidekicks” (with less dialog) and any number of hirelings (with no dialog). You might wish for less dialog when you stumble onto the new indiscriminate romance options for the main companions. Fortunately you can shut them down quickly. The limited ability system of the original game was expanded to a ridiculous degree. The new ability trees are so complex that I didn’t bother to fully understand them. I just kept the difficulty level low and spent my very few choices on any ability that sounded good. Here I much preferred the older system. One related change for wizards makes more sense: grimoires are now fixed, instead wizards get to pick extra spells from their ability tree. PoE’s curious endurance/health split was removed in favor of a standard health system, but once again with a twist: depleted health or some other afflictions (usually traps) cause an injury. Four injuries mean death. While health recovers automatically or through interventions, injuries can only be healed by resting — with food assigned to the character. That’s one new function of food, the other being to keep your ship’s crew happy. They don’t participate in the combat/health system but insist on eating once per day, and the quality of food they get determines their morale. All told these are good changes, giving a previously irrelevant resource some gameplay significance. Aside from the massively (and honestly rather excessively) increased size of the game, some obvious design shortcuts from the original are gone. The world is no longer littered with NPCs that drop random soul trivia on the Watcher. He still has the soul-reading ability but now only uses it in actual quest contexts, and there are a lot more of those too. Indeed the world is packed with interactions, with no obvious placeholder content. Dialog is now fully voice-acted as well, or close enough that it doesn’t matter. In conclusion, I should say that Deadfire is both much bigger and substantially better than the original game. Yet there are few surprises here, given that the background story and main characters were already established, and a lack of ambition in storytelling left me somewhat bored in the end. There is a certain sense of unfulfilled promise after the grandiose setup. Nevertheless, anyone who enjoyed Pillars of Eternity should also enjoy Deadfire. Oh, and if you ever come across a dungeon called Hall of the Unseen do read the linked spoiler first, or you’ll go crazy trying to get through the labyrinth. I also thought PoE 2 was more playable (and more fun) than the first game. I only found my way through the Hall of the Unseen by blind luck.